The courtyard at Victoria Garden Mews is filled with resilient, habitat-friendly plants. Comfortable benches encourage residents to linger. Photo: courtesy of Grace Design Associates, Inc. This is the second in a 4-part series we’ve named Planting the New California Garden. Throughout 2017 we’ll be highlighting the work of APLD designers to illustrate practical water-use data beautifully brought to life in a finished landscape. Our Planting the New California Garden series is funded in part by a grant from the Saratoga Horticultural Research Foundation. 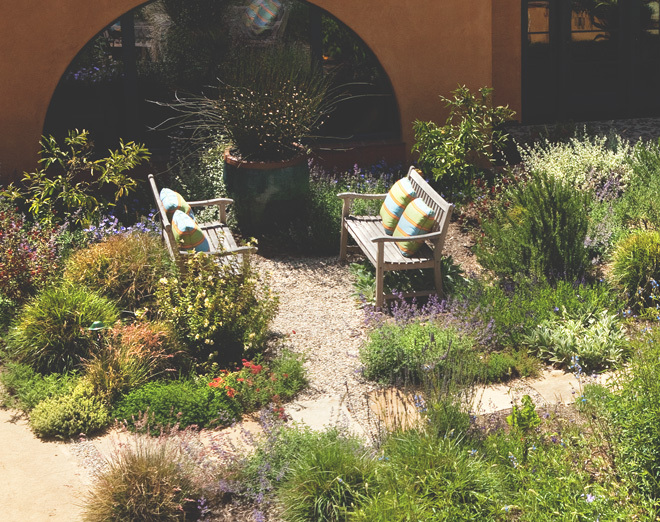 Margie Grace and her team designed Victoria Garden Mews to be a sustainable oasis—a certified LEED platinum oasis—for three families in Santa Barbara. 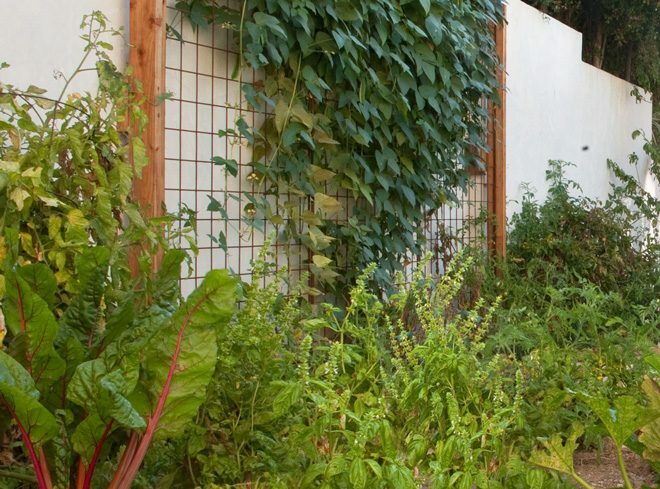 A water-thrifty garden is the heart of this small, private development, with space for people to dine, relax, and grow food. Most of the landscape consists of drought-tolerant plants that offer habitat for native species, but humans also thrive among the shared fruit trees and vegetable garden nearby. The cordoned and espaliered fruit trees are productive but unobtrusive, and when they need supplemental water from the 14,000-gallon rainwater cistern, it is delivered through a high-pressure irrigation system that minimizes evaporation. The California Department of Water developed the Water Use Classification of Landscape Species (WUCOLS) project in response to the relative lack of research-based information classifying plants by irrigation need. The first edition, completed in 1992, compiled field trial results and observations contributed by regional evaluation committees made up of knowledgeable horticulturists from throughout California. 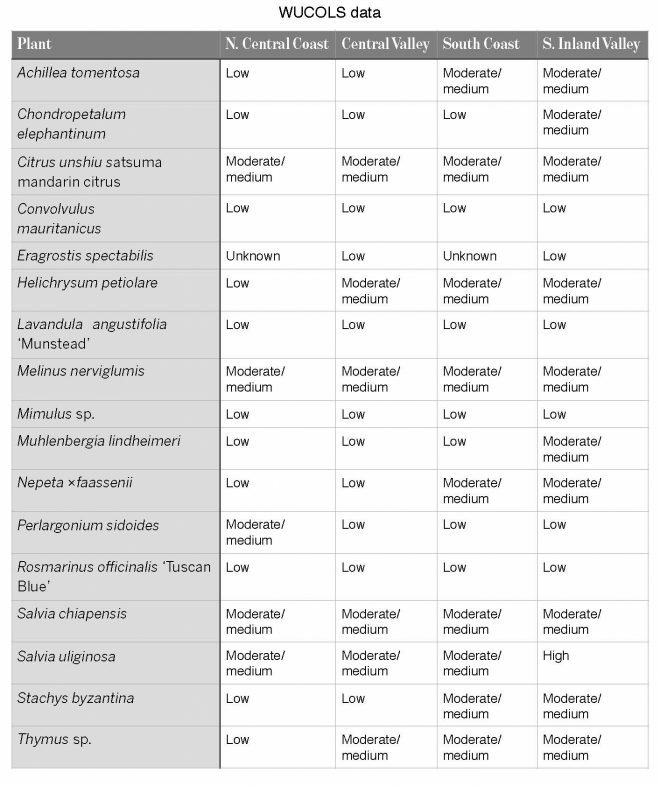 Now in its fourth edition, WUCOLS IV evaluates water use needs for more than 3,500 commonly available California landscape plants. The information-rich database is freely available online and is intended to serve as a reliable resource for anyone involved with planning, designing, and managing landscapes. 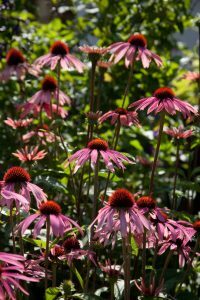 Coneflower (Echinacea sp.) Photo: courtesy of Grace Design Associates, Inc. Productive vegetable plantings filled raised beds along the walls in the Victoria Garden Mews courtyard. Photo: courtesy of Grace Design Associates, Inc.
Margie Grace, founder and lead designer of Grace Design Associates, Inc. is committed to sustainable development and collaborates with other green professionals in the Santa Barbara area. Victoria Garden Mews is certified by the Sustainable SITES Initiative.